Old aerial photographs and postcards are to me the most interesting group of historic images of Toronto. They provide a picture of a constantly evolving city that undergoes, at times, profound transformation from one decade to another. There are numerous examples of these, so I picked only my favourites for the post. The above photograph (circa 1920) shows Old City Hall from the southwest. Today, the view of the building is probably obscured by the Thomson Building and the Simpson Tower at the corner of Queen West and Bay streets. The stretch of Bay, just west of the City Hall, was known as Terauley Street at that time. The structure on the site of the present Eaton Centre is the former T. Eaton Co. Ltd. factories and the main store, demolished in the mid and late 1970s to make way for the mall. Across the street from the City Hall, at Richmond Street, is the former Temple Building, one of the city's first skyscrapers, erected in 1896, and sadly, reduced to gravel in 1970. This photograph was taken circa 1924, and depicts the St. Lawrence Market neighbourhood, near Front and Church Streets. The market building is visible in the middle of the photograph, on the left hand side. The most striking feature of the image, Gooderham's Flatiron Building, erected in 1892, is still there today. Originally, it stood on the site of the three-storey Coffin Block Building, built in 1845. George Gooderham was the son of William Gooderman, the founder of the Gooderham and Worts Ltd. His office was located on the fifth floor, right under the copula, from which he had a commanding view of the nearby area and his bank across the street. 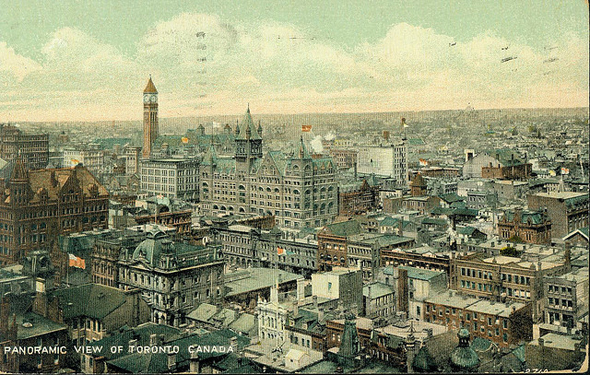 This postcard is most likely from the 1920s and shows a more panoramic view of the area in the vicinity of Old City Hall. The Temple Building is also visible here, and the structure southwest of the tower of the City Hall is the Confederation Life Building, located at Yonge and Richmond Streets. 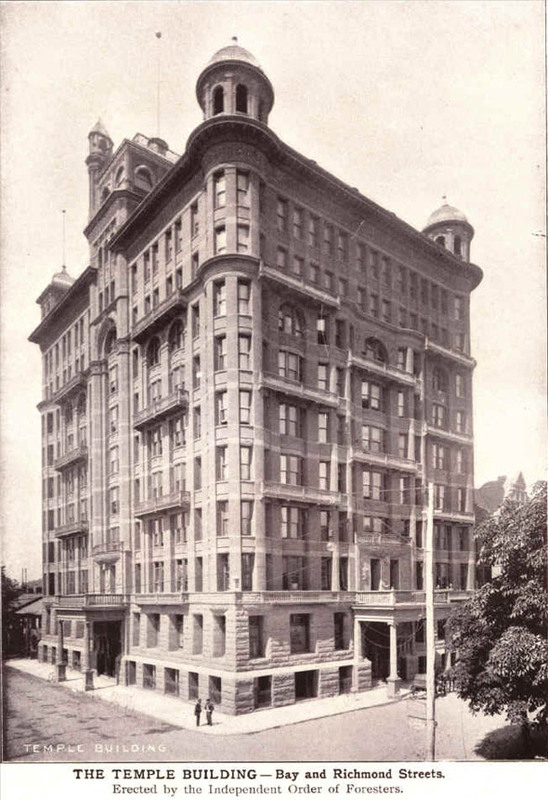 It was constructed in 1872, and designed by Knox Elliot and Jarvis in the style of Romanesque Revival, and served as the headquarters of Confederation Life, an insurance company. What I like about the postcard is how it contrasts with the black and white photographs of the area. The city looks still, as though it has been frozen in time, with no signs of smoke or traffic. 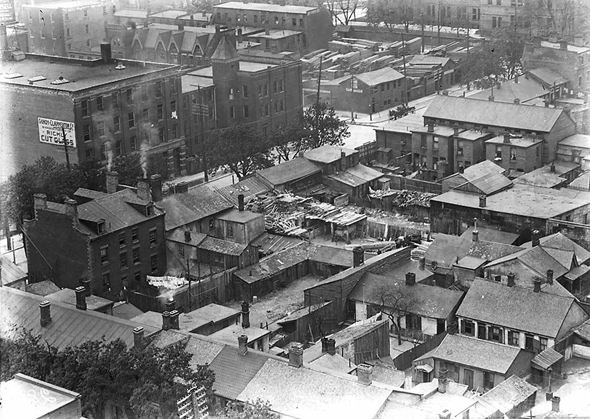 Not all of downtown was a thriving place during the first two decades of the twentieth century. 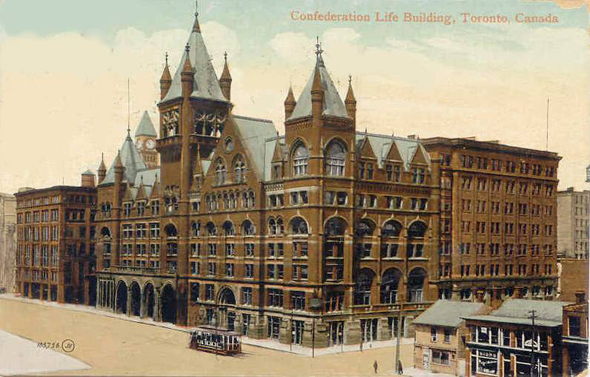 Neighbouring City Hall was an area originally known as the Ward, and now encompassing the Discovery District, bounded by College Street, Yonge Street, University Avenue, and Queen Street. Between the 1830s and well into the 1940s, it served as a settlement for newly arrived immigrants, mostly Jews, Italians, Chinese, and Eastern Europeans. A municipal report from 1918 dubbed the district as a "slum," conveying deep disdain for the living conditions of its inhabitants. 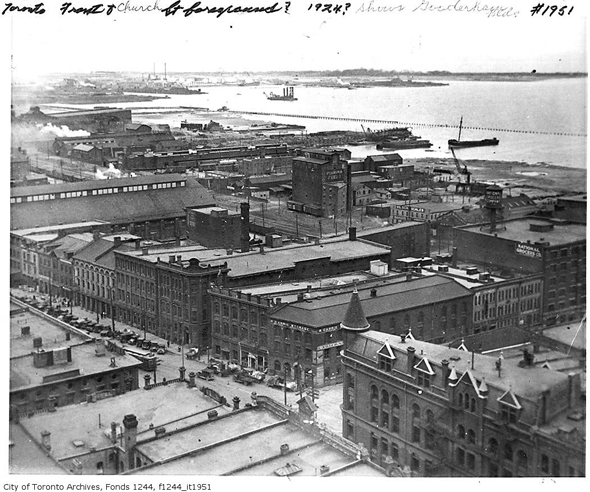 This last photograph was taken in 1910 from the roof of one of the Eaton factories, and down the street from the Osgoode Hall, visible at the top right. The new City Hall and Nathan Philip Square now occupy the site. Images from the Wikimedia Commons and the author's collection.